Most of the outrage that follows a politician decrying “treason” is manufactured. Democrats raised hell when Rep. Allen West joked that there were “79 to 83” communists in Congress; anyone who asked West knew he was referring to the House Progressive Caucus. In 2008, Chris Matthews tripped up and fileted Rep. Michele Bachmann when she went along with the idea of checking fellow politicians for “un-American” ideas. It’s fund-raising fodder. Bachmann’s fact-finding mission (I’m being kind) for Muslim treachery is a little different. For quite a while, since her presidential campaign diminished her political stature, Bachmann has been amplifying the worries of Frank Gaffney and other “anti-Islamofascists.” They wonder whether the Muslim Brotherhood has inflitrated the United States government. So does she. After a challenge from Rep. Keith Ellison, her fellow Minnesotan and the first Muslim in Congress, Bachmann issued a 16-page letter explaining where the treachery might be coming from. It’s mostly familiar, public domain stuff. Apart from Fox News, ABC News, and other sources, Bachmann relies on documents from the Holy Land Foundation trial that informs a lot of worry about the Brotherhood. She scores a point on the Obama administration for pooh-poohing the risk of Brotherhood wins in Egypt. Given the reasonable assumption that Ms. Abedin has a high-level security clearance, as a member of the House Select Committee on Intelligence I am particularly interested in exactly how, given what we know from the international media about Ms. Abedin’s documented family connections with the extremist Muslim Brotherhood, she was able to avoid being disqualified for a security clearance. And that brings us to John McCain, who took to the Senate floor today – days after the letter – to unload. The letter alleges that three members of Huma’s family are ‘connected to Muslim Brotherhood operatives and/or organizations.’ Never mind that one of those individuals, Huma’s father, passed away two decades ago. The letter and the report offer not one instance of an action, a decision, or a public position that Huma has taken while at the State Department that would lend credence to the charge that she is promoting anti-American activities within our government. Nor does either document offer any evidence of a direct impact that Huma may have had on one of the U.S. policies with which the authors of the letter and the producers of the report find fault. 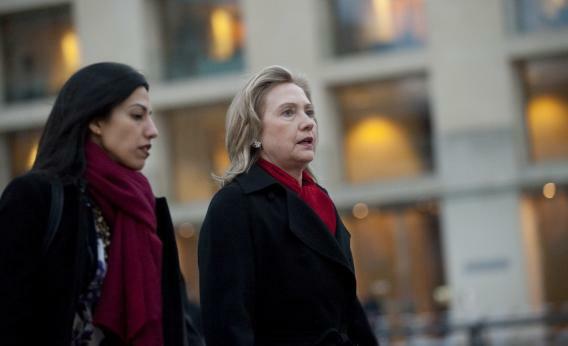 These sinister accusations rest solely on a few unspecified and unsubstantiated associations of members of Huma’s family, none of which have been shown to harm or threaten the United States in any way. These attacks on Huma have no logic, no basis, and no merit. And they need to stop now. But as with the Abedin case, this suggests no “inflitration.” Infilitration implies secrecy. As Eli Lake reported last month in an embarassing story for the Obamaians, Hani Nour Eldin is a member of the Egyptian parliament and a member of Gamaa Islamiya, designated by the U.S. as a terrorist group. He didn’t sneak in. It was a diplomatic meeting that State took heat for, publicly. Bachmann’s mistake with the 16-page letter was thinking that the name-drop of a famous Muslim connected to scarier Muslims would raise questions about how the government vets possible terror allies. She’s done the opposite.